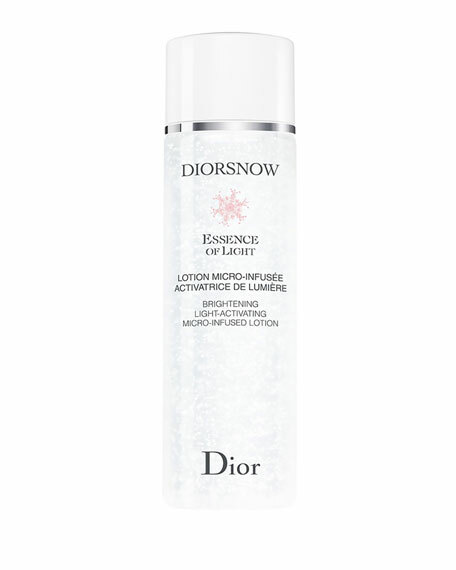 Dior Snow Micro-Infused Lotion, 6.76 oz. DiorSnow Micro-Infused Lotion, 6.76 oz. The Diorsnow Brightening Light-Activating Micro-infused Lotion is the 1st brightening moisturizing lotion* enriched with Edelweiss & microcapsules of soothing vitamin E.
As the lotion fuses into the skin, the microcapsules melt like snowflakes in the spring, fusing into the ultra-fresh, gel-liquid texture to release their active ingredients. The skin is instantly softer, suppler and naturally more radiant. Day after day, spots and shadow areas are diminished revealing a fresh rosy skin, that appears illuminated from the inside. **Test: self-assessment, % of agreement, 60 Chinese women after 1 month of use. THE EXCEPTIONAL BRIGHTENING POWER OF THE EDELWEISS FROM DIOR GARDENS. Skin evenness and colour are determined by a pigment known as melanin. With aging and repeated sunlight exposure, the undesirable sallow colour of melanin spreads all over the skin, altering its evenness. Over time, melanin also becomes darker, damaging the natural skin colour. Dior researchers have discovered that Edelweiss extract from the Dior Gardens in Switzerland interferes in this process and can diminish, correct and prevent the creation of dark spots deep down. Preventive action against spots deep inside the skin is one of the most effective ways to achieve lasting efficacy on skin evenness and colour correction. THE DIOR GARDEN IN SWITZERLAND. Edelweiss is cultivated at the heart of the Valais Garden in Switzerland at an altitude of 1,100 m. In this beautiful but hostile environment, temperatures can drop until -10°C while UV intensity is extreme, heavily reflected by the eternal snows. All the conditions are gathered for Edelweiss to develop the finest flowers, naturally and in the greatest respect of the environment.